The Apple 21.5" iMac measures at just 5 mm at its edges, which is 40% less volume than the 2011 iMac. The 21.5" widescreen display features LED backlighting for vibrant, accurate color. With in-plane switching (IPS) technology, the iMac has a wide 178° viewing angle. The screen has a 16:9 aspect ratio and Full HD 1920 x 1080 native resolution, supported by integrated Intel Iris Pro Graphics 6200. 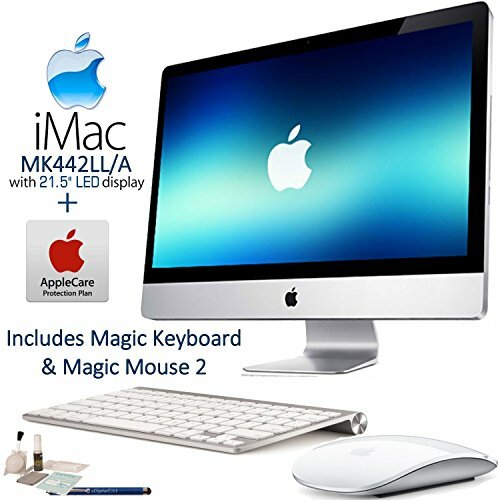 The iMac houses a 5th-Gen Broadwell 2.8 GHz Intel Core i5 Quad-Core processor with 8GB of 1867 MHz LPDDR3 onboard RAM. For storage, the iMac has a 1TB 5400 rpm HDD. Outfitted with 802.11ac Wi-Fi (backwards compatible with 802.11a/b/g/n) for the speediest hook-ups to your home network, this iMac is also configured with Bluetooth 4.0, as well as an SDXC card slot for extra storage, four USB 3.0 ports, two Thunderbolt 2 ports, and a Gigabit Ethernet (RJ-45) jack. It also has a Kensington lock slot for added security. For ports, the iMac has dual Thunderbolt 2 ports (which also double as Mini DisplayPorts) and four USB 3.0 ports. You'll be able to connect with various compatible components. If you would rather go wireless with your peripherals, you can use Bluetooth 4.0 technology where compatible. If you have any questions about this product by Applecare, contact us by completing and submitting the form below. If you are looking for a specif part number, please include it with your message.